Home » cash » F&N » Food n Beverage » lucky » lucky draw » offline contest » purchase » spend » F&N “Hang Masuk, Hang Menang” Contest: Win up to RM50,000 Cash! 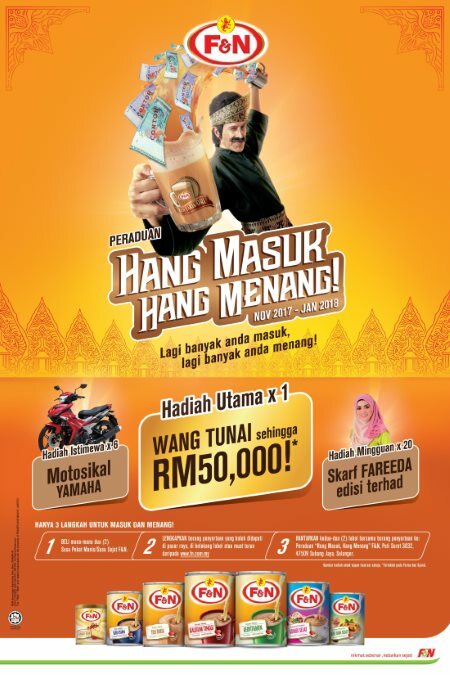 F&N “Hang Masuk, Hang Menang” Contest: Win up to RM50,000 Cash! Purchase any two (2) F&N Sweetened Creamer / Condensed Milk. Complete the Contest Form (which you can get it from Supermarkets / from the back of the label / photocopied /downloaded, and printed from F&N website). F&N “Hang Masuk, Hang Menang” Contest, P.O. Box 3032, 47509 Subang Jaya, Selangor Darul Ehsan. Visit F&N “Hang Masuk, Hang Menang” Contest page for more details.